DC’s best hope against their rivals at Marvel. These days Marvel’s success as a film studio appears as a mere formality. They announce a movie and sometime later hordes of people around the world dutifully pay to see it. Since 2008’s Iron Man, each new Marvel film now builds on the success of the one before it while buttressing the creative scaffold for the next. Marvel’s eventual decision to make films this way should not come as a surprise. Their shared comic universe was, at least in some small part, the source of the company’s original success in the 1960s. The principles of Marvel’s shared universe are simple to explain and intrinsic to the nature of many comic books, including DC’s. First, explain who these characters are, and second, outline how they relate to each other. In this way, comics can engender an investment of emotion over time from the reader and entice an audience to come back for more as events fold outwards. That this idea marries well with a modern film studio’s desire for financial certainty and repeatable success over time feels obvious. We’re seven years into a process which Marvel has declared will carry them into 2019 (and presumably beyond). There’s an implicit trust at work here–they’ve established the characters and are now showing us how they relate to one another. But considering it only took God seven days to make the world, there is also some serious time and labour involved. DC’s big reveal at Comic Con, meanwhile, feels like an attempt to speed up this process. After Christopher Nolan’s self-contained Batman trilogy ended in 2012, DC unofficially kick-started its own shared universe with 2013’s Man of Steel, directed by Zack Snyder. While it exists apart from Nolan’s trilogy, Snyder’s Superman piggybacks on its darker tone. This, it announces, is to be DC’s visual and thematic palette moving forward. While Marvel has been content with a lighter touch, DC wants to be epic and operatic. It’s painfully easy to find fault with this direction, especially given Superman’s status as the original primary colour superhero. But what’s been shown of Batman v. Superman: Dawn of Justice and Suicide Squad so far gets at a larger problem. Both trailers are, in a word, overwhelming. For Dawn, we see images of Henry Cavill’s return as Superman, Ben Affleck’s new Batman, Jesse Eisenberg’s Lex Luthor, General Zod’s corpse, Robin’s graffiti-ed costume, and, deep breath, Gal Gadot as Wonder Woman. This feels like a lot for two and a half hours. The role call for Suicide Squad—featuring Will Smith and actual operatics—is even longer. Now, some of these glimpsed moments, taken in isolation, are quite powerful. Dawn of Justice promises a stand-off between two of the most iconic fictional characters of all time. It also appears, not incidentally, to use some of Frank Miller’s famous The Dark Knight Returns as a visual touchstone. It’s a smart play, even if we’re left to wonder how, for example, Wonder Woman fits in. This is where DC’s decisions start to feel creaky. 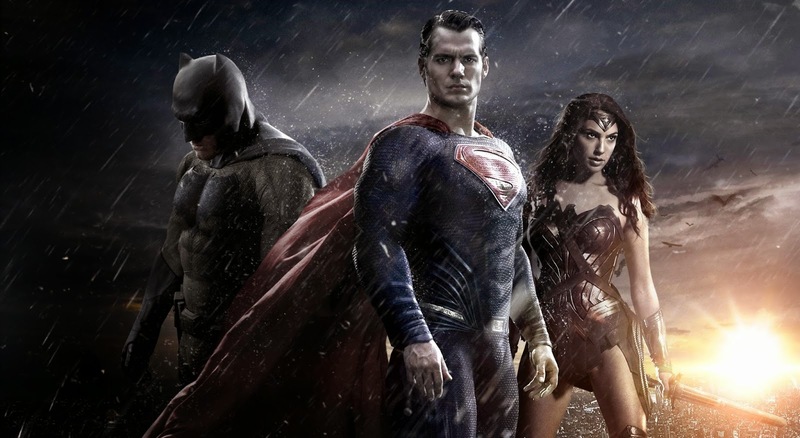 While Marvel stokes anticipation in-film, DC makes rather large assumptions outside of it. For Wonder Woman’s presence to make sense in Dawn, it will require some pre-existing knowledge of the character. She’s decidedly not the focal point of the film—it says so right in the title. Her importance is inferred only by the knowledge of a standalone Wonder Woman film planned for 2017. A follow-up Justice League movie—uniting the trio of Batman, Superman and Wonder Woman—is then supposed to ignite the expansion of DC’s shared universe into which the rest of its roster of characters will appear. It’s bold, but also backward. Since movie trailers are all tease, DC’s plan looks sound on the surface. The trailers imply a unified galaxy of worlds filled with a multitude of stars set for their own solo adventures. Dawn of Justice features the company’s three biggest characters, while Suicide Squad looks to build, in one quick flurry, an entire constellation of villains. DC has it all scheduled out after that. It’s quite a feat, considering the quick turnaround time. But through all that noise, it disregards the necessary emotional under-girding inherent to proper comic book storytelling. Who are these superheroes and villains? Why are they fighting? And why should we care about, say, Aquaman in 2017 when his story will only be told in full in 2018? In their race to compete with Marvel, DC has disregarded those aforementioned universal tenets. Now the gigantic scope makes sense—these films are designed to be too big to fail. The Avengers getting interrupted by the demands of narrative. To fight against the franchising of Hollywood now is a losing battle. And while it feels strange to commend one corporate behemoth over another, this is the film universe we live in. To its credit, Marvel’s grand design does not prevent their individual films from standing on their own. They breathe in places and even leave room for a laugh or two. The most memorable sequence of the latest Avengers movie, Age of Ultron, is not the climactic robot battle but rather when the gang just hangs out. Here the audience’s investment in these fictional characters pays off. We know who these people are. The film leverages that well-earned familiarity, and its cast of charismatic actors, into a moment of cinematic pleasure. Everyone has fun. That we get lashed to an expository rocket ship afterwards is besides the point—in DC’s new universe, all we’ll be getting is the ride. It may provide for a bigger bang, but it could also blow up in somebody’s face. Reblogged this on De todo un poco. Great post! Marvel really has done an excellent job of getting audiences to invest in their characters, and I am worried about DC being able to replicate that. I personally loved Man of Steel, and I’m sure I’ll equally enjoy Dawn of Justice, but that’s largely because I’m such a big fan of the heroes in the abstract. Maybe they can get away with limited development with the most iconic superheroes, but Aquaman and Wonder Woman? I’m going to need some convincing. A critique without being too critical. You don’t see this kind of commentary that often. A very well written piece on the movie universes of DC and Marvel. Reblogged this on Black illusion. I’m old enough to remember the Golden Age of Comics and that background helps explain DC’s challenge. The DC universe predates Marvel. DC characters feel like the WWII era while Marvel is derivative, but more “hip” with a 1960’s feel. Superman was a break through and set the stage for “super powers” while Marvel, in a less idealistic time, perfected the “science gone awry creates the conflicted freak super hero” genre. Even so, from the comic book perspective and even TV show perspective, DC has as much to work with as Marvel. DC started strong with Christopher Reeves Superman and Batman, but they have really screwed it up since by changing actors and rebooting more than the Rockette’s chorus line. Imagine how much worse Ironman would be without the consistent presence of Downey Jr. Spiderman is already starting to slide. Marvel best not get too confident – take away Downey Jr. and they don’t look that much better. Thor? Hawkeye? Black Widow? – even the comics weren’t great. Marvel botched the Fantastic Four and Hulk. Captain America? not so much. Give ma a consistent Caped Crusader and a Julie Newmar-ish Catwoman and nothing can beat Batman. I think Marvel definitely has the better collection of superheroes. But personally I like DC more because their characters are more human, like Batman. Are these movies really that big that they will never fail? These movies aren’t the first foray by DC! The TV series Arrow began it by thinking the Green Arrow with Flash in a couple of link up episodes! They also mention the suicide squad! This has been building a while and personally I am jovial at the prospect! I definitely prefer Marvel but I can appreciate DC. I loved your critique, it was as unbiased as it could get and it was an easy read. Great post! i m not gonna kill u i m just gonna hurt u really really bad . I’m more of a Marvel girl myself, but I was really looking forward to seeing Wonder Woman make it to the big screen. I was really disappointed to see that her debut would be as a side character people were less likely to be emotionally invested in. I hope this doesn’t cause problems for the upcoming Wonder Woman movie. These universes, both Marvel and DC, need movies centered around a female superhero. So far all the girls have been taking supporting roles. Let’s hope Batman vs. Superman doesn’t affect Wonder Woman’s success, so we can get more female superhero movies from both studios. Some comments have some elements of confusion, so it should be noted/clarified however, that there are many different franchises, not just DC and Marvel. Marvel has the Xmen franchise, which Fox owns the rights to. This began as an original trilogy, and then a reboot, but with mega franchises being such big business, the release of Days of Future Past attempted a retcon of sorts, implying the entire film series is in 1 film universe. The big one is Marvel Studios, which have the Marvel Cinematic Universe (MCU) which most people identify as the main marvel franchise, and includes the Avengers. Agents of shield and Agent Carter are MCU tv shows, whilst Daredevil, Luke Cage etc, will firm another, unrelated TV universe. Incidently the Fantastic Four currently reside on their own, but time will tell if they get incoroprated into another universe later on. DC meanwhile have a less complicated system post Nolan’s Batmans. There is the film Universe, including Man of Steel, and the upcomming suicide squad and Superman/Batman films, which is building considerable hype. Building the hype, in tandem, is a group of TV shows. Gotham is a solo afffair and takes a different tone from most, but the true franchise is the CW, who have the Flash, Arrow, and the upcomming DC Legends of tomorrow. Supergirl is said to be unconnected, but again, time will tell. As you can see, there are many franchises and continuities. Personally, I find this a bit scattered, but credit to Most of marvels franchises for slowly building things up into unique, seperate tales. Hopefully DC rights being owned by Warner Bros will provide a good unified direction and stop things getting too sloppy and out of hand. Compared to the multiple studio rights with Marvel, this could prove to be DCs trump card. But that dark, slow, brooding tone may become its undoing, as audiences tire of the darkness and monotony and seek Superhero films which balance drama and Epic tales with a sense of humour and feeling of fun and enjoyment!